NOTE: July 2013 marks my “Gosh I don’t know how many times I have read this book” annual Re-Read! My Review (REPOSTED): I will be changing all my ratings of this series to 5 because I have come to the conclusion that if I can re-read them this many times they are worthy of a 5! What I Loved: I love the first book in this series. For some reason when I pick it up (and I would have a hard time reading the rest of the series without reading this one again), it transports right to a very magical place. It is great to be introduced to the characters and how their friendships were formed.O ne of my favorite moments is learning how the 3 kids became friends: there are some things you just share that you cannot help but become friends and Downing Mountain Trolls are one of them. What I Liked: You have to like that all the characters (good and bad) you are given a chance to learn more about and truly come to feel strongly about! In re-reading the books it is fun to go back for clues of how some situations can look differently when viewed after knowing all the facts. Why I gave it a 5: After reading all the books do I think it is the strongest? No! 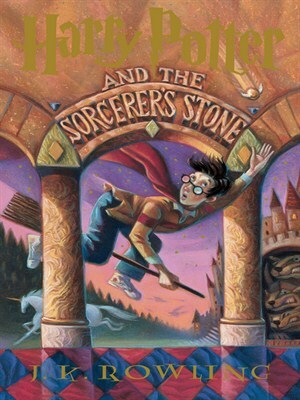 However, it is the book that started the whole series off and laid a fantastic groundwork for all the books to come! That is no easy feat and this book did it brilliantly. It is worthy of a 5 in my book. I can’t wait to see what you think of the rest of the series! This first book laid everything out perfectly. Hook. Line. Sinker. There was never a doubt in my mind that we’d keep reading. Really need to do them all on audio. How I looooove Harry Potter! I also re-listened to all audiobook in German and we had an fantastic narrator!! I still would love to listen to the british audiobooks and to the US. Did you listen to the US version? You’re so right. I need to try the Fry version. I do love Harry Potter and used to re-read all the time before I started blogging but right now the TRB is huge and the only Harry is see is the movie and my glasses. I really have Harry Potter glasses and everyone loves them. These books are perfect for audiobook rereads! I’ve slowly been making my way through them and they’re so great to listen to. I’ll have to get the Jim Dale versions sometime …. I’ve been listening to the Stephen Fry ones and they’re great! I seriously need to reread this series. I LOVED it the first and second time around and the last time I read it was right before the final book released. EEP! I am so looking forward to when I can read these with my kids. I can’t wait!